Graduates celebrate with friends and family after the graduation ceremony. 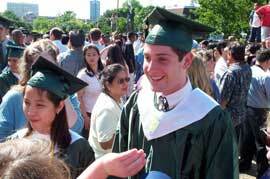 High school graduations take place at the end of the spring semester, usually in June. Graduations can take place indoors or outdoors, at the school or at another place, depending on the size of the graduating class. Before the ceremony begins, the graduating seniors, dressed in “caps and gowns,” walk in while the march “Pomp and Circumstance” is played. After everyone is seated, the school principal makes a short speech welcoming the parents and friends of the graduates. Then the valedictorian—the student with the highest academic rating—gives a short speech. The valedictory speech is followed by remarks from the main speaker, often a prominent member of the community or an important dignitary. After the speeches are finished, students are called to stand to receive their diplomas. One by one, in single file, they walk to the center of the stage where their names are read as they receive their diplomas. The new graduates then move the tassels on their caps from the left side to the right side. This signifies that they have graduated. After all the graduates have returned to their seats, the principal presents the entire class for the last time to their parents and friends.